This Pinup Photo was added on Thursday 28 July, 2016. Another 'Aviation Pinup Series' pinup featuring Brittany and the Republic P-47 Thunderbolt. First flying in 1941, the P-47 was introduced into Army Air Force service in 1942. Serving mostly in the European Theater, the P-47 is one of the biggest (not to mention heaviest!) single engine fighter aircraft ever built! With a full armament, the P-47 could weigh about 8 tons! It was armed with eight .50 cal guns, four on each wing. Topping out at just over 430mph, the P-47 could travel 800 miles in combat mode. It could carry bombs, rockets, or drop tanks for extra fuel. Over 15,600 were built with it finally being retired in 1966 from the Peruvian Air Force.This pinup is part of a new 'simple' type of aviation pinup that I'll be doing more of in the coming months using Army Air Force, Navy, and Marine aircraft ranging from fighters to transports to bombers. Each will feature a pinup with an aircraft and the matching US insignia for that aircraft as we go through each branch of the service honoring the pilots and aircraft of WW2. The background will also be themed to the aircraft's color schemes during the war. This is a new 'simple' type of aviation pinup using Army Air Force, Navy, and Marine aircraft ranging from fighters to transports to bombers. 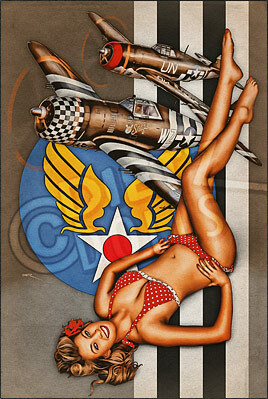 Each will feature a pinup with an aircraft and the matching US insignia for that aircraft. The background will also be themed to the aircraft's general colors. The Dietz Dolls Aviation Pinup Series features World War 2 aircraft (called Warbirds) paired with a pinup model wearing authentic flight clothing to the 1940s era. Available for purchase in all sorts of different sizes including posters!